In recognition of its excellent export performance, RCL has been accredited with the status of STAR EXPORT HOUSE by Govt. of India. 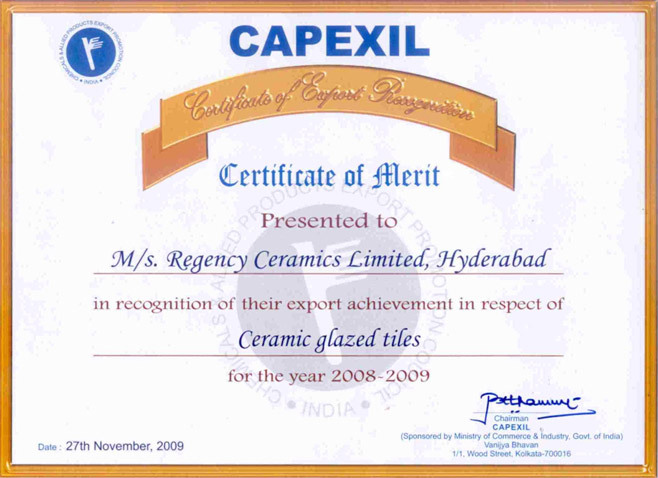 RCL continued to receive the certificate of Merit award in recognition of Export Achievement since 1998-99 from CAPEXIL., Ministry of Commerce, Govt. of India and Samman Award 1998-99 from Ministry of Finance, Govt. of India for the best export performance at the zonal level in the category of Exporters-Manufacturer Exporters. RCL is among the top 10 in the ICD list for the maximum number of export containers handled by Container Corporation of India Ltd, Hyderabad. 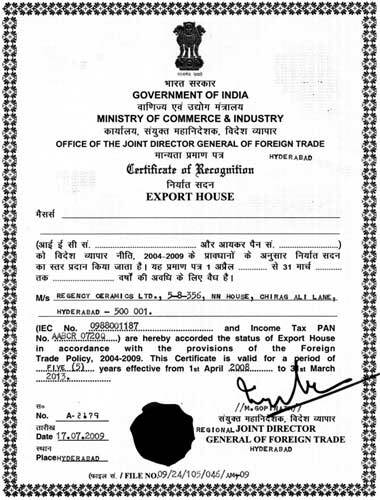 Certificate of Merit & Trophy for Export Recognition from Ministry of Commerce (CAPEXIL), Govt of India. Outstanding Export Performers Special Award from Ministry of Commerce (CAPEXIL), Govt. of India – Hat Trick !! 1st Rank Fastest Growing Tiles, Ceramics & Sanitary ware Company in India by Construction World. International Quality Crown Award in the Gold Category from Business Initiative Directions, Spain – awarded in London, U.K. Outstanding Export Performers Special Award from Ministry of Commerce (CAPEXIL), Govt. of India. First in top 10 ICD performers for highest export loaded containers handling by M/s.Container Corporation of India Limited, Hyderabad. Surana Udyog Silver Rolling Trophy for the best export effort in the state issued by FAPCCI,Andhra Pradesh. Certificate of Merit & Trophy for Export Recognition (Special Award) from CAPEXIL in recognition of outstanding export performance.